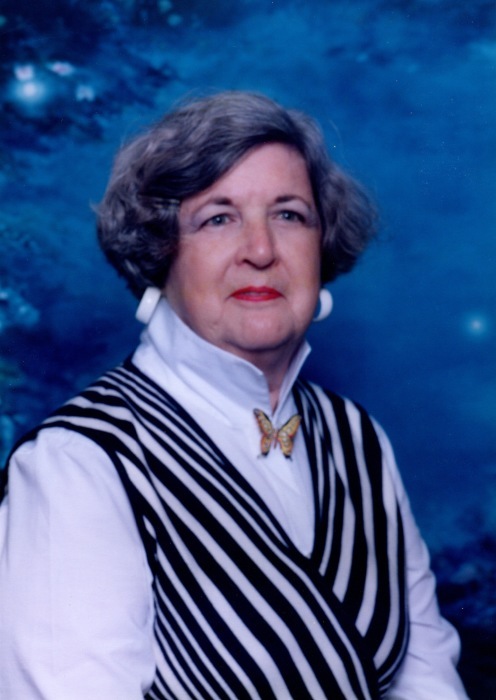 Mary Elizabeth Burnett Quaintance, 87, of Knightdale, passed away peacefully on Sunday, September 9, 2018, surrounded by family. Mary Elizabeth (Melba to her siblings) was born in Burgaw on October 12, 1930 to Mamie Ruth Deaton Burnett of Troy and John Henry Burnett of Pender County. She attended Greensboro College in Greensboro and lived most of her adult life in the greater Raleigh area. Mary had a zest for life, love, singing, acting, baking, gardening, and spending time with her large family. She sang for many years in the Raleigh Oratorio Society and the Jim Marshall Singers, including numerous performances at Raleigh’s Memorial Auditorium with the North Carolina Symphony. She especially loved singing Handel’s Messiah at Christmas. In her younger days, she acted in plays at the Raleigh Little Theatre, and she was recently active in several senior groups with a large network of friends. A service to celebrate her life will be held 10:00 am, Saturday, September 22, 2018 at L. Harold Poole Funeral Service Chapel, 944 Old Knight Road, Knightdale, 27545. The family will receive relatives and friends immediately following the service at the funeral home. Mary was preceded in death by her parents and her sisters: Annetta Collins (late husband Batch) of High Point, Ruth Phillips (late husband Al) of Edenton and Phyllis Burnett of Burgaw. She is survived by her brother, Gilbert Burnett of Wilmington; sister, Susie Jones (late husband Dave) of Raleigh; brother, Julian Burnett (wife Vivian) of Wilmington and sister, Sylvia Crippen (late husband Rex) of Lakeville, CT. She is also survived by the children she loved so much – son, John Waldorf of Bucks County, PA; daughter, Pandora Parker (husband George) of Raleigh and sons: Wynton Waldorf of San Jose, CA, Bill Quaintance (wife Karen) of Apex, Jack Quaintance (wife Sonya) of Apex and Wes Quaintance of Mocksville. Her loving grandchildren include: Shannon Parker Rabon (husband Ashley) of Tega Cay, SC; George Parker of Raleigh, Shane Parker of Fuquay Varina, Courtney Parker Manduley of Wendell, Jordan Parker Hoff (husband Matt) of Clayton, Zach Waldorf of Lanham, MD, Marc, Russell, and Vincent Quaintance of Apex, Noah and Conor Quaintance also of Apex. Mary’s amazing great-grandchildren are Hannah, Ellie, Riley, and Macy Rabon, Sawyer and Henry Parker, Ava and Peyton Hoff and Jaxton Manduley. Mary will be dearly missed by her family and friends. We will always love and remember you Mom, Grandma, Mary, Melba. In lieu of flowers, donations are requested to Covenant Christian Church of Cary, 2911 SW Cary Pkwy, Cary, NC 27513.